This saucy, tender, melt in your mouth Mexican Shredded Beef is slow cooked in the oven to perfection. It’s great in tacos, burritos, quesadillas and nachos. I’ll pop a warning right here that this recipe is a longer one to prepare. It takes about 3 hours in total to come together. The hands on time is very minimal, but it’s definitely not a weeknight wonder! This is the recipe you should pull out for a Mexican themed dinner party, or meal prep on the weekend to enjoy in meals throughout the week. With that said, let’s talk about just how good this Mexican Shredded Beef Recipe is. It might take a bit of time but it is OH SO WORTH IT. We’re talking saucy, tender, melt in your mouth beef. And that really only comes from slow cooking, which I prefer to do in the oven. But wait, why not make it in a slow cooker? Could this recipe be made in a slow cooker? Probably. But I despise slow cookers. I have ruined more meals than I care to admit in a slow cooker, and after a few very frustrating weeks trying to come up with some easy slow cooker recipes for you guys earlier this year I decided to pack in the towel and admit defeat. I’m not good at using slow cookers. I find every meal I try to convert lacks flavour and it just isn’t worth it for me. But slow cooking food the old fashioned way in an oven. Oh my, I’m SO good at that. I nail it every time. So forgive me but I’ll have to stay in my lane. And this recipe right here is perfection if you make it in the oven. Do I really have to brown the meat? Yes. If you skip this part, you’ll miss out on so much flavour. It’s a little more work for maximum reward. 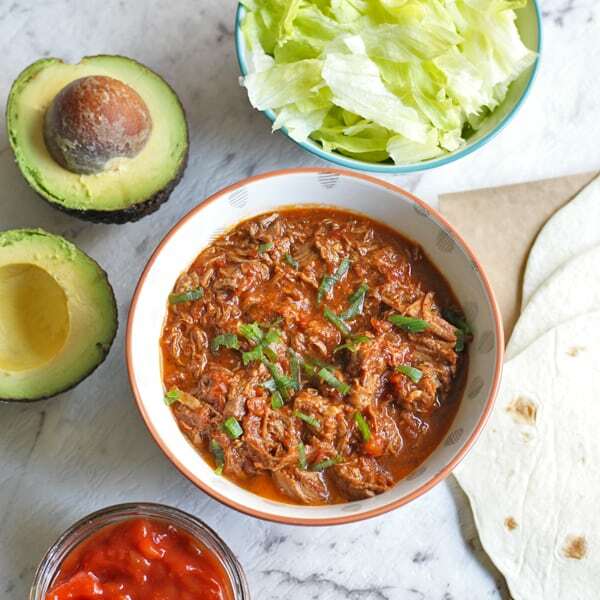 How should I use my Mexican Shredded Beef? Great question. I use it in burrito bowls and tacos, but really it could compliment most Mexican dishes. Think quesadillas, enchiladas or nachos! This saucy, tender, melt in your mouth Mexican Shredded Beef is slow cooked in the oven to perfection. It's great in tacos, burritos, quesadillas and nachos. Heat oil in dutch oven on high heat. Add beef in batches and cook so it is browned on all sides. Remove into a bowl. Lower heat to medium, and if the pan is dry add a little more oil, then cook onion and garlic for 2-3 minutes until softened and golden. Add cayenne pepper, paprika, cumin, garlic powder and oregano and stir to combine. Pour a little stock in to start, and scrape any browned meat that has attached to the bottom (there is so much flavour in this). Add meat, the remaining stock, lemon juice, diced tomatoes, worcestershire sauce, apple cider vinegar, chipotle in adobo sauce and bay leaves to the pot. Season with salt and pepper and stir to combine. Bring the mixture to boil over high heat, pop the lid on the dutch oven and transfer to the oven for 2 - 2 1/2 hours (stirring twice in this time) until meat is tender and falls apart easily. Discard bay leaves. Remove the meat and place on a large cutting board. Shred the meat with two forks, then return to the pot to absorb any of the leftover juices. Serve the meat warm and use in your favourite Mexican dish - burritos, tacos, quesadillas, burrito bowls or on top of nachos! Cooking time for the beef will vary depending on the cut you use etc. I'd start checking on it around the 2 hour mark to see if it's easily shredding, and then go from there. The recipe is forgiving, so if you need to keep in the oven a little longer while waiting for guests, you'll be fine! Nutrition information is a rough estimate based on 1 of 8 serves of the beef. That sounds like my kind of party Julie! So thrilled you and your guests enjoyed this!